Companion Animal Psychology is shortlisted for the People's Choice Award: Canada's Favourite Science Blog. Vote for your favourites! 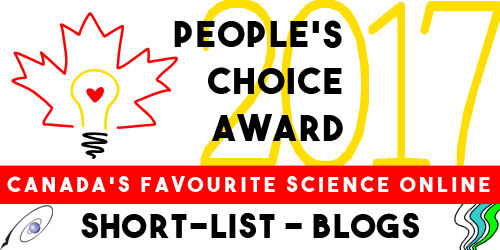 I am thrilled to have been short-listed for the People's Choice Award: Canada's Favourite Science Blog. You can see the shortlist and vote here on the Science Borealis website. Voters can select their three favourite blogs and three favourite science websites (so you have six votes in total). It's a great way to show support for your favourite science sites and blogs and find new ones to follow too. You can follow the contest on social media via the hashtag #CdnSciFav. Every day from now until the close of voting on 14th October, Science Borealis and SWCC will be promoting the short-listed blogs and websites on social media. The contest is part of Science Literacy Week (#scilit17) here in Canada which celebrates science with events across the country. Three finalists in each category will be announced during the week of October 23rd, and the winners will be announced at the Canadian Science Policy Conference (Nov 1-3) and on social media.